What exactly is a MagicBand? MagicBands are plastic and rubber bracelets containing an electronic chip. Depending on which features are activated for you, the MagicBand can function as your room key, resort entrance gate opener, park ticket, FastPass+ redemption mechanism, charge card for food and merchandise, interactive game piece, PhotoPass identifier, MagicalExpress voucher, and more. The full potential of the MagicBands has yet to be realized since the technology is very adaptable. Walt Disney World is in the nascent stages of using guest MagicBands as an attraction special effects activator (for example, MagicBand users are given a personalized message in the last scene of the "it's a small world" attraction). More MagicBand capabilities may be unveiled in the future. What technology is used in the MagicBand? The MagicBands contain a Radio Frequency Identification (RFID) chip. The device sends and receives signals via a small antenna in the band. The Radio Frequency device works in short range situations (touching the band to a hotel room’s “key pad”) or in mid-range situations (perhaps activating a portion of a ride or game). Out in the real world, RFID technology is used in some credit cards, in highway toll paying such as EZPass or SunPass, in some video game controllers and in many other situations. Chances are you may already be using an RFID device at home and not even be aware of it. How do I physically use a MagicBand? Most of the time you simply tap the Mickey icon on the face of the MagicBand onto an electronic reader. There are electronic readers on all the WDW resort room doors, at most counter service and table service restaurants, at most merchandise locations, at all park entrance gates, and at all FastPass+ attractions. Guests of the Disney-owned hotels may elect to make purchases using a MagicBand. If you choose this option, you will generally be required to enter a PIN at the time of food/merchandise purchase as a security measure. You can self-select your PIN during online resort check-in or upon check-in at the front desk of your Walt Disney World resort hotel. For those who reside in the United States and staying at a Walt Disney World Resort Hotel, MagicBands are shipped to guests’ homes prior to their travel, assuming that the reservation is made at least ten days prior to check-in. If you live outside of the U.S., or if there are timing glitches or the reservation is made on short notice, the bands will be available at the hotel front desk during check-in. Disney World Annual Passholders can also request one free MagicBand each year. You also can just buy one (see below). Can I get a MagicBand if I’m not staying on property? Yes, but not for free. All modern park tickets are wallet-sized RFID-enabled cards that work at the park entrances and FastPass+ scanners. You do not need a MagicBand to get into the park or to use FastPass+. However, if you would like a MagicBand, you can purchase one from one of the many Walt Disney World gift shops or from shopdisney.com. The current price is around $13 per solid color band and up to about $35 for commemorative bands or those with specialty artwork. Guest-purchased MagicBands can be linked to existing park tickets and then used just like a ticket. How do I control my MagicBand functions? Many of your MagicBand functions are controlled via My Disney Experience (MDX). MDX can be accessed at the DisneyWorld.com website or through a free downloadable app on your table or smartphone (Apple App Store, Google App Store, etc.). 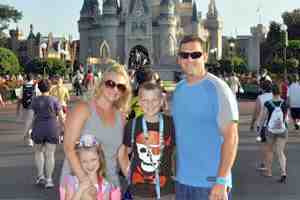 Kristina Murphy gives a good overview of the My Disney Experience experience here and here. You can activate or deactivate the food and merchandise charging capability of your MagicBand when you check into your Walt Disney World resort hotel. How to I link my park tickets to my MagicBand? If you have purchased a full package from WDW, your park tickets should already be loaded onto your MagicBand. If you have a room-only reservation, you can manually add your park tickets to your MagicBand via the My Disney Experience website. This works both for tickets purchased through Disney (online, at a Disney store, leftover no-expire tickets, etc.) and for tickets purchased through third party vendors such as Undercover Tourist or Maple Leaf Tickets. On the MDX site, go to “My Reservations,” scroll down until you see “Link Tickets,” and follow the steps from there. This is a matter of personal taste, although most people seem to agree that they are not uncomfortable. The band size is highly adjustable, allowing it to accommodate everyone from a preschooler to a linebacker. Anecdotal evidence is that the key to comfort is proper sizing. Keep adjusting yours until you get the fit just right. What color MagicBands are available? The current colors available for resort guest complimentary bands includes: purple, pink, green, red, orange, blue, gray, and yellow. If you end up not pre-ordering your MagicBands and getting them at your resort, then basic gray is your only option for a free band. As mentioned above, there are dozens of specialty bands available at additional cost, and you can even get custom-printed designs at certain stores. You're welcome to purchase and use specialty bands even if you've been given a basic band at your resort hotel. Additionally, you don’t like the look of your basic MagicBand, there are embellishments available for purchase. These include fabric wraps which completely envelope the band as well as an array of clips, charms and sliders depicting Disney characters and icons. Can the MagicBand help me keep track of my children? While technically possible, this is not a current feature and it is probably unlikely to happen. That being said, if a lost child is found wearing a MagicBand, it is theoretically possible that a cast member could scan the MagicBand, find the link to the parent’s reservation number and possibly a linked phone number. If our children were lost, we would not rely on this nascent technology. You can easily write your cell phone number on the inside of your child’s band, thus greatly reducing the time it takes to find the number. The inside of the bands are all a dark grey. In our experience, the metallic silver color Sharpie has the most “pop” on this surface. Can I get my MagicBand wet? Yep. No problem. You can swim and shower with your MagicBand. Can members of my party share MagicBands? With the exception of the biometric finger scanner at any given park entrance, there is nothing to stop you from having Little Sis use Mom’s MagicBand to use an additional FastPass+ allocation. However, by the letter of the Disney law this is not allowed. The bands are non-transferrable, even among family members. There are many situations (such as FastPass+) in which using a MagicBand alerts a cast member to the MagicBand holder’s name, meaning that a cast member might call Little Sis “Bertram” if she uses Grandpa’s MagicBand to get an extra spin on Space Mountain. Does having a MagicBand mean that I don’t have to bring my wallet into the park? No one ever made you bring your wallet into a theme park, but it's a good idea, even if you have a MagicBand. For instance, if you find yourself in the unfortunate scenario of having to go straight from a park to a medical care facility, you will be better off carrying a photo ID, proof of medical insurance, and a real credit or debit card on your person at all times. Additionally, there are a number of Disney-related cards you may want to carry because their functions are not yet contained on the MagicBand. For example, if you are a Tables in Wonderland (TiW) card holder, you need to have the card with you to redeem that discount. The MagicBand does not contain this information, nor is there any current way to link TiW status to a MagicBand. And even though an Annual Pass (AP) is linked to the MagicBand, if you wanted to take advantage of an Annual Pass merchandise discount, you would still need to show an AP card AND a photo ID. Right now, having a MagicBand simply means that you have one more item to keep track of, not less. As the MagicBand gains more functionality, this may change. What happens if I lose my MagicBand? If you happen to misplace your MagicBand at Walt Disney World, go to the front desk of your hotel or to any park guest relations office as soon as possible and report the loss. They will deactivate the band so that other guests cannot enter your room or otherwise use the missing band. You will be issued a replacement band. Replacement bands are uniformly gray. If you can’t get to your hotel or guest relations office right away, you can deactivate your band yourself using the MyDisneyExperience website or app. Got to the manage MagicBand section, select your band, and then deactivate. You can get a replacement later. Are there any medical contraindications with using the MagicBand? The MagicBand packaging does include a few medical notices, particularly for guests using implanted pacemakers or cardioverter-defibrillators. If you use these or any other medical device such as an insulin pump, neurostimulator, or hearing aid, you’re encouraged to seek medical counsel about RFID interaction with your physician and/or your medical device manufacturer. Please read the warnings enclosed with your MagicBand. Can an individual have more than one MagicBand? Yes, although MagicBands are reusable. If you have one you like, you can continue to use it during future visits. Manage this function via the MyDisneyExperience website. I'm a frequent Disney World visitor. Do have to get a new MagicBand for every stay? There is now an option on MyDisneyExperience to decline receipt of a MagicBand with your hotel stay. If you've already got enough MagicBands to have them double as Christmas tree garland, you may want to decline additional bands. However, you should be aware that the internal MagicBand batteries have an advertised shelf life of two years, regardless of use level. Even if you love your favorite MagicBand you should consider getting a new one periodically. Both my daughters want pink MagicBands. How can I tell them apart? Pre-ordered MagicBands have each guest’s name printed on the inside. If you end up getting last minute or replacement bands without and imprint, we suggest that you physically write each owner’s name inside the band yourself. I’m concerned about privacy. Is “Big Brother” (“Big Mickey”) watching me when I use my MagicBand? If you’re asking whether Disney is collecting information about you when you use a MagicBand, then the answer is yes. They will know when you go to your room, when you enter the parks, how much you’re spending on merchandise and so on. None of this is particularly new. In the past, any time you entered a park or paid for merchandise with a Key to the World Card, Disney also gathered this information. Personally, we're not too worried about it. Nor are we worried about RFID hackers roaming the parks. While a hacker could, in theory, obtain your MagicBand ID code through nefarious acts, they would not be able to access your credit card information or other personal data because these items are not stored on the Bands themselves. If you’re nervous, you can limit exposure with a MagicBand in exactly the same way as you would with a credit card, by paying for food/merchandise with cash. In addition, you might feel more comfortable if you input the bare minimum of data when activating your MyDisneyExperience account. Disney has very large privacy/use notice on the MyDisneyExperience website. Feel free to peruse. Can I use my MagicBand at places other than Walt Disney World? Right now, the only non-WDW application of the MagicBand involves the new Disney Infinity electronic game system. Apparently if you place your MagicBand on the game controller, Tinker Bell flies out of your TV and fluffs the pillows on your living room couch. Or maybe not, we're not really gamers. MagicBands are not currently used at any of the Disney theme parks outside Orlando, nor are they in use on the Disney Cruise Line ships. I’m interested in the business implications of MagicBands. Do you have information about this?